One of the main reasons why investors lose out on making big profits in the market is because they sell their shares too soon and usually at the wrong times. One of the main reasons why investors lose out on making big profits in the market is because they sell their shares too soon and usually at the wrong times. Sometimes it's their sentiments and sometimes it's the market. However, to be able to book profits and avoid losses, you must know when not to sell your shares. One of the biggest mistakes an investor can commit is to sell his/her shares in a bearish market. Before investing, you should clearly determine what your objective and the maximum amount you are comfortable losing if the investment tanks. Until this limit is crossed, you should retain your shares even if the market is going down. If the market is on the lower side, you should not panic and should not sell the shares in a hurry. Selling shares when the market is bearish is the main reason investors lose out on significant money-making opportunities. The market is never stagnant; it always rises. It can take some time, and you have to be patient. But selling shares in a bearish market is one the worst things you can do. This is a time when you should buy more shares, as people will be selling their shares based on the same panic and this will lead to a fall in the price of that particular stock. Some investors are of the view that they have to sell their shares when the price goes up or when it goes down, even if it is by a slight margin from the cost price of the shares. This is a classic example of investors losing money because of their low-risk appetite. You should set your mind even before buying an investment. That is, you should decide on the amount of money you would want from a particular investment and should sell your shares only when the set objective is achieved. The best way to know when to sell shares is to analyze the performance of the company. Other external factors that influence the price of the shares, such as demand and supply, market trends, investor sentiments, etc., are generally temporary in nature, and you must wait a little while longer to sell your shares. If the performance of the company is not according to your standards and you think it will take years for the company to be profitable again, then only should you consider selling its shares. While it is true that a scandal or news about a top executive leaving the company can become the reason of share prices going down, it is not necessary that the company will never be able to bounce back in the future. 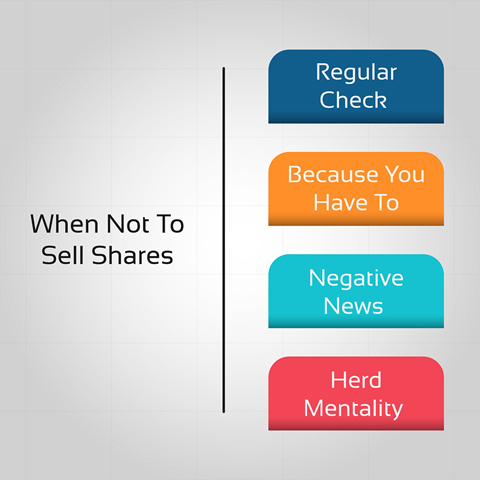 One of the biggest mistakes investors can make is to sell their shares because of negative news going around about the company. You should trust your initial judgment about the company being good enough to handle any setbacks it can face in the future. If a top executive has left the company, the share prices will go down, but it is fairly possible that the executive will be replaced by a new one having the same qualifications and qualities. Selling your shares depending on a negative news will always result in regret. Take Google for example, what Google has achieved till now is all because of Larry Page, but he left the CEO's post and named Sundar Pichai his successor. The shares of Google are higher today than they ever were. You should trust the company enough to know that it can overcome any hurdles and will rise stronger than ever. And when it does, you will be the one booking huge profits. The one time every successful investor knows you should never sell your shares is when everyone else is selling. Avoid the herd mentality at any costs. Something that can prove profitable to a person can become the reason of a huge loss to you. You must have financial goals that are different compared to every other person. Selling stocks just because everyone else is will always result in you losing money in the market. Analyze the market, look over your financial goals, and determine your risk appetite before selling your shares. Keep away from unnecessary advice. The best person to give you financial advice is you.